As I’ve mentioned several times over the last few weeks, we currently have a Tough Mudder event prep program going on at my Sacramento – Land Park kettlebell training studio. Well, it’s starting to get really fun, because we’re doing some cool and different stuff – like unique exercises/workouts designed around getting better at specific obstacles, using new and different training equipment, etc. Move directly from one exercise to the next without setting the kettlebells down. Repeat complete circuit five times, resting 60 seconds between rounds. In conclusion, if you’re looking to hit every major muscle group, increase your functional strength, and shoot your conditioning levels through the roof, double kettlebell workouts are a great place to start. Incorporate these two into your existing kettlebell workout programming for increased results today! 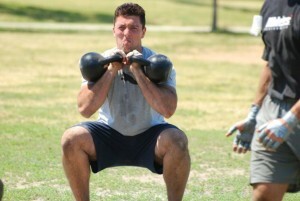 PS – Want to learn more about kettlebells in Sacramento, CA? Click here.